You could say that Phil Spahr knows his stuff. Especially Car Stuff. After a brief stint as an Ohio Buckeye at Ohio State University (he’s still a huge fan), Phil made his move to Boulder in 1974 and began a career as an auto painter working for Continental Coach Rebuilders. Since then he has perfected and refined his skills, working across the country on every make and model available – Toyota, Mercedes Benz, BMW, Dodge, Audi, Ford, Chevrolet, Mitsubishi, Ferrari – you name it. So it’s no surprise that Phil found the beautiful town of Steamboat Springs to both find a home and further his career. He gained a position at Russell’s Auto Salon, and soon after purchased the business, along with partners Terry Paulsen and Don Gittleson, in November of 1990. Phil has helped grow business into what it is today, one that many locals would rightfully term the “best auto body shop in Steamboat.” If you want your car back into the condition it was “pre-accident,” Russell’s Auto Salon is the place to go. Phil has a staff of experts who have been with him for years (some, decades! ), and their experience is evident in their work. Needless to say, running the largest auto body shop in Steamboat means Phil is at the shop a lot. But he does get away now and then, and when he does, he likes to fish and hunt (pheasant and turkey). Often his hunting adventures take him to Kansas, which happens to be the home of his favorite restaurant: Big Ed’s Steakhouse in Bird City. You will indeed find that, if you speak with Phil, he knows his stuff…something you want in the person in charge of getting your vehicle repaired! Owner Terry Paulsen’s had an interest in cars – cool cars – since high school, when he owned a 1972 Chevy Nova in Griswold, Iowa. In 1980, Terry’s passion for building, rebuilding, and fixing cars led him away from construction (“that lasted less than a year”) straight to employment at Kelley’s Body Shop in Elliott, Iowa. If you love what you do, you learn fast – and Terry loves what he does! Terry left Kelley’s in 1984 to move with a friend to Steamboat Springs, where they worked together at Weber’s Auto Body (formerly Russell’s). In 1988, Russell Drobney returned and reclaimed the Body Shop, renaming it Russell’s Auto Salon as it is known today. 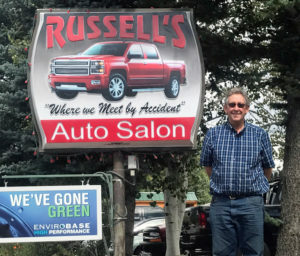 Being a true expert in his trade by this point, Paulsen, along with partners Phil Spahr and Don Gittleson, soon purchased Russell’s Auto Salon in 1990 and have continued and furthered it’s reputation of experience and excellence throughout Northwest Colorado. Terry still loves to rebuild and fix old cars; it remains a beloved hobby to this day. He recently rebuilt and revamped a 1990 Geo Tracker and is currently working on an even bigger project to debut this summer. 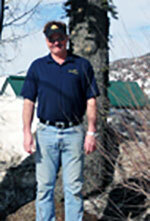 When he’s not at the Salon, he loves to spend time at his wife’s cabin near Elkhorn Mountain, which he also caretakes. During the winter months, Terry often snowmobiles with his 15-year-old son. They also love to ATV and jet ski during the summers, and fish year-round. Being from Iowa, Terry knows a good steak, and so you’ll likely find him eating at Steamboat’s Ore House – his favorite!